Former City College student Cathy Speck speaks to professor Joanne Moylan-Aube’s Psychology of Death and Dying class March 10 about her struggles with ALS. Photo by Elizabeth Ramirez. Legendary Yankees player Lou Gehrig is not only known for his triumphs as an all-time great first baseman, but also as a pioneer in raising awareness for the terminal disease that killed him in 1941. “I might have had a tough break, but I have an awful lot to live for,” said Lou Gehrig in 1939 during his goodbye speech at Yankees Stadium, explaining that even though his disease stopped him from playing baseball, he didn’t let it stop his love for life. Lou Gehrig’s disease—amyotrophic lateral sclerosis (ALS)–is a disease that gradually kills the nerve cells in the brain and spinal cord, which control the muscles all over the body, eventually making it hard or impossible to walk, talk, eat, swallow or breathe. Most people diagnosed with the disease die within 3-5 years after the onset of symptoms, but in rare cases, people can live for much longer. Cathy Speck, 54, is a former City College student diagnosed with ALS in 2009 who lives by a mantra similar to Gehrig’s. Speck says she believes that learning about the ability to cope with the loss of loved ones through humor gave her a completely new lease on life. Speck spoke to City College Professor Joanne Moylan-Aube’s Psychology of Death and Dying classes March 10, something she has done many times before. But because of Speck’s worsening condition, Moylan-Aube said Speck might not be able to do so for much longer. “Each time that I ask her [to speak to my classes], I always keep my fingers crossed, and hope and pray that she’s still capable,” Moylan-Aube said to the class before Speck began her talk. 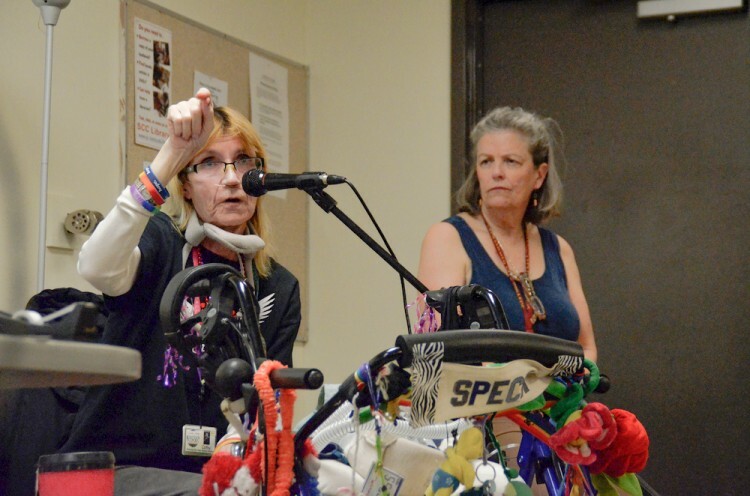 After expressing how happy she was to be able to talk to the class, Speck—who sat on a stool behind her colorfully decorated walker, full of stuffed animals, rainbows and even a horn—started by addressing the disease. Speck explained that she is not the only person in her family diagnosed with the disease. Her aunt, two of her siblings and her mother all died from ALS. Speck said her mother began experiencing muscle weakness when she was approximately 49. Doctors first diagnosed her mother with tennis elbow because, initially, her symptoms were mainly showing up in her arms. In February 1971, when Speck was 12, the family assembled for a meeting and Speck’s dad explained to her and her seven brothers and sisters that their mom’s diagnosis was ALS. He read information about ALS from a pamphlet, which included information that the disease is fatal. “I knew whatever these people thought they were talking about, they were not taking into consideration my mom because my mom could beat anything,” Speck said. As Speck continued to address the class, she explained that the family took care of Speck’s mom at home for a while, but eventually she had to be admitted to the hospital. Speck paused during her story to explain to the class that she was going to be funny, but first she needed to explain the devastation she went through so that people could understand why humor is a big part of her life. “The last time I saw her, I said ‘see you later.’ That’s what I said,” Speck explained as the room went silent. She said that two nights later, the phone rang at four in the morning. “[My dad] came in and he sat down at the edge of my bed. He said, ‘Honey, mommy died,’” said Speck. As Speck looked around the room at the students’ saddened faces, she said, “I know,” acknowledging to the room that this was the sad part of the story. After her mother died, Speck said her life went into a downward spiral. According to Speck, she grew up in an era when it often wasn’t okay to talk about things like death and the associated feelings with which the loved ones of the deceased must cope. While a student at Sacramento State, Speck played basketball for the college team. After blowing out her knee, Speck went through a very dark time in her life. She related how she jumped from addiction to addiction, suffered from bulimia and anorexia, and dealt with symptoms of depression, including self-mutilation and feelings of wanting to commit suicide. Then one day, she noticed a beautiful little girl in a childhood photo and realized it was she. Knowing that she could no longer continue to put that little girl through such things, she decided to turn her life around by returning to school to explore her interests. Speck enrolled in classes at City College, including Psychology of Death and Dying. After completing the class, Speck decided to focus on humor, singing and the other things she loved in order to cope with all the pain in her life. In recent years, because of her experiences with the disease, she has not only become an expert on it, but also works to raise awareness through participation in events like the Greater Sacramento Walk to Defeat ALS, and other events. In 2010, Speck went skydiving and said she decided it was the perfect way to raise awareness about ALS. Speck now works to help raise ALS awareness and money for research through her ALS Skydiving Specktacular, which will be holding its fifth annual event May 17 in Davis. Students in the class were asked to turn in a one-page response to the speech that will be given to Speck to read. For Speck, being able to help others by telling her story along with enjoying life through humor is the reason she gets out of her hospital-style bed every morning. “When I came here, when I was hurting and I was looking for something, I found it here,” said Speck after she was finished talking with the class. To learn more about Cathy Speck or to find out more about ALS awareness events including the May 17 skydive, visit her website at www.cathydyingasliving.com. This entry was posted in Features, Sac City Express (SCC) and tagged ALS, Cathy Speck, class, college, daniel wilson, death and dying, Elizabeth Ramirez, Former City College student Cathy Speck, Lou Gehrig, psychology, Sac City College, Speck. Bookmark the permalink.